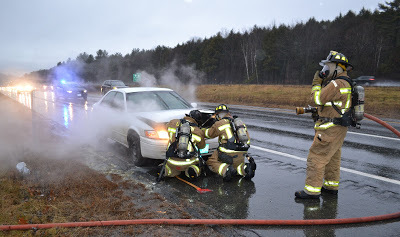 Lebanon Police and Fire Department attended a car fire on I-89 on Tuesday. Fire officials say the police arrived on scene first and discharged a dry chemical fire extinguisher that knocked down the main fire in the engine. The Lebanon Fire Department was able to extinguish the fire after gaining access to the engine compartment. The US Department of Transportation wants Newport to remove their NH PASS SIGNS. The signs showing distance required for cars passing bicyclists according to the US DOT is non-conforming and must be removed from NH Highways. NH PASS signs came into being from the efforts of former Newport Town Manager, Dan O’Neil an avid biker. The sign’s intent was inform motorists of NH law RSA 265:143-A – Drivers to exercise due care when approaching bicycles. The NH DOT responded to the US DOT that the signs were a public service message and not a traffic sign. However, the US DOT disagreed and asked the state to remove them by December 1, 2015. Newport however did not receive notice of the sign removal until December 14. According to the NH DOT, the signs can be moved to locations outside of the highway but would be considered outdoor advertising and require an advertising permit from their department. Town Manager Sean O’Keefe said he notified NH DOT about the notice being received after the deadline and they gave him until January 1. Dan O’Neil could not be reached for comment. The NH Fish and Game Commission is seeking nominations for their 2015 Awards of Excellence. If you know a person or organization that has made a difference for New Hampshire wildlife, fisheries or open land, furthering the N.H. Fish and Game Department’s mission, honor them with a nomination. To nominate a person or organization for one of these awards download the nomination form at http://www.wildnh.com or call the Fish and Game offices at (603) 271-3511 to be mailed a form. Posthumous nominations are allowed but nominations must be postmarked no later than December 31.
and Jeff Dagesse’s home was made unlivable from a fire. The family was not at home but they lost most of their clothing and personal belongings. The Washington Fire Auxiliary has started a collection to help them reestablish their daily lives while they work through temporary living arrangements and get their home repaired and inhabitable again. Anyone wishing to contribute clothing, gift cards or cash can bring them to Town Hall during normal business hours (M-F 9-3), or the Police Department for distribution to the family. Checks can be mailed to Dagesse Recovery Fund, 7 Halfmoon Pond Rd., Washington, 03280 with Dagesse Recovery Fund in the memo field. Please call Deb Defosse at Washington’s Town Hall at 603-495-3661 or email ddefosse@washingtonnh.org if you have any questions.